Back in 1984, we were next-door neighbors raising our families in the little town of Delaware, Ohio. Two moms with small children, we were looking for a way to do what we loved and stay home with the kids too. We had always shared a love of home cooking and making memories with family & friends and so, after many a conversation over the backyard fence, Gooseberry Patch was born. We put together our first catalog at our kitchen tables, enlisting the help of our loved ones wherever we could. From that very first mailing, we found an immediate connection with many of our customers and it wasn’t long before we began receiving letters, photos and recipes from these new friends. In 1992, we put together our very first cookbook, compiled from hundreds of these recipes and, the rest, as they say, is history. Hard to believe it’s been over 25 years since those kitchen-table days! From that original little Gooseberry Patch family, we’ve grown to include an amazing group of creative folks who love cooking, decorating and creating as much as we do. Today, we’re best known for our homestyle, family-friendly cookbooks, now recognized as national bestsellers. One thing’s for sure, we couldn’t have done it without our friends all across the country. 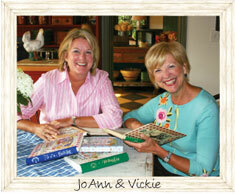 Each year, we’re honored to turn thousands of your recipes into our collectible cookbooks. Our hope is that each book captures the stories and heart of all of you who have shared with us. Whether you’ve been with us since the beginning or are just discovering us, welcome to the Gooseberry Patch family!